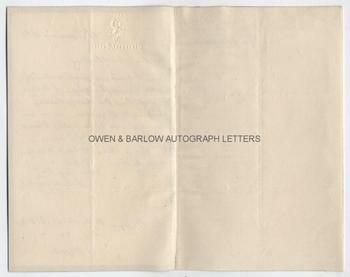 SIR JOHN BOWRING Autograph letter Signed. British (English) political economist and colonial administrator. 4th Governor of Hong Kong. ALS. 1p and integral blank leaf. Claremont, Exeter. 16th January 1864. To Sir Stafford Northcote. 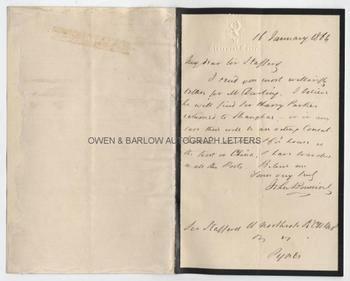 "I send you most willingly letters for Mr Darling. I believe he will find Sir Harry Parkes returned to Shanghai - or in any case there will be an acting Consul. Jardine Matheson & Co's house is the first in China and has a Grandee [?] in all the ports." 8vo. Approx 7 x 4.5 inches. There is a paper backing to the verso of the integral blank leaf and slight mounting traces to verso, else fine. Sir John Bowring was one of the greatest polyglots, knowing 200 languages and virtually fluent in 100. He was a renowned political economist and advocate of parliamentary reform. 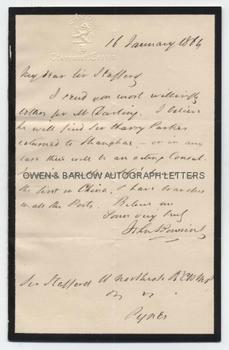 In 1849 Sir John Bowring was appointed Consul General in Canton, China and in 1854 was sent to Hong Kong as Governor. During his tenure the Second Opium War (1856-1860) took place, which most commentators blamed on Sir John's high-handed policies. Mr Darling is probably Charles Henry Darling (1809-1870) who was at various times governor of Newfoundland and Victoria, Australia. Sir Harry Parkes had been acting Consul at Canton in the Opium War. He had tried to negotiate under a flag of truce but had been taken prisoner and tortured. He was sentenced to be executed but was released by the Chinese in 1861 and returned to Canton, where he established several consulates on the Yangtzse and tried to reach an agreement with the Tai'ping rebels at Nanking. He returned to England in 1862, where his captivity and his role in the war had made him famous. He was appointed to the Consulship in Shanghai and left England in January 1864 to take up the post.